Hard day of work or university? It’s still important – and delicious – to cook yourself (and your friends and family) a delicious meal. 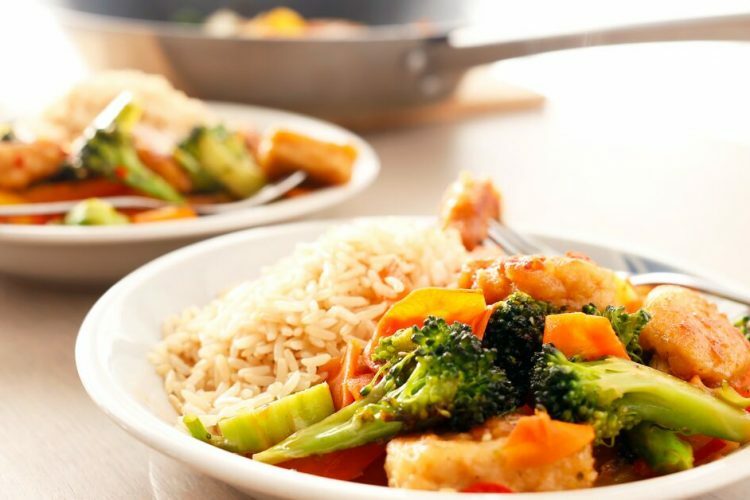 This easy vegan wok recipe is an easy way of preparing a great meal with vegetables. It will surprise you with a hint of citrus as well. Curious? We have the recipe here! To prepare, first bring water to a boil and cook rice according to the instructions on the pack. Meanwhile, rinse all vegetables. Cut the broccoli in smaller bouquets, julienne the red bell pepper, and finely chop the chili. Cut thin slices of carrot with a mandolin or a carrot peeler. Heat 2 tbs of cooking oil in a wok or a deep frying pan. Thaw the small bag with Mandarin Orange sauce in hot water. Fry the Crispy Chick’n for 6-8 minutes until golden. Stir in the sauce and lay aside. Heat 2 tbs of cooking oil in the same wok or pan. Add the vegetables and fry over high temperature for 3-4 minutes. They should still be crispy when finished. Stir in the Mandarin Orange Crispy Chick’n and sauce. Serve with rice, soy sauce and lime. Enjoy this easy vegan wok alone or with friends. You can always change up the vegetables to your liking. Enjoy!